My older sister shipped me a box of old double-sided 78 RPM shellac records from when we were kids in the 1950s. She asked her geeky brother how she could listen to them now. My old Radio Shack turntable is 33 and 45 RPM only. I have heard that there is some software that will convert the input from these old records converted at the wrong speed to make them play correctly. What is this software? Or do you have another suggestion/solution? Download a copy of the free, open source audio editor Audacity. With your turntable attached to a pre-amp or stereo receiver, take an appropriate line-out from the amp/receiver (Tape Out, for example), and run it into your Mac. (Use a stereo miniplug to RCA adapter.) Set the turntable to play at 45 RPM. Configure Audacity to record from the Mac’s input port (likely the Line In port). To do this, choose Preferences -> Audio I/O and choose the audio input you’re using from the Device pop-up menu. Click OK to dismiss the Preferences window. Now click Audacity’s Record button to start the recording and drop the turntable’s needle at the beginning of your 78. Try to record a couple of seconds of “silence” (meaning the hiss and crackle at the beginning). When the music plays it will sound slow and dreary, but we’ll fix that in a second. When you’ve played through the record, click Audacity’s Stop button. Change the speed from 45 to 78. Save the file and choose Effect -> Change Speed. 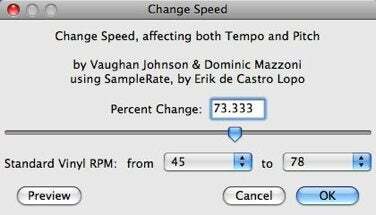 In the Change Speed window that appears you’ll see pop-up menus for Standard Vinyl RPM. Configure these so they read From 45 to 78 and click OK. Audacity will now change the pitch so the recording plays as if it was recorded at 78 RPM. It’s highly likely that there’s going to be a lot of hiss and noise in your recording. To help eliminate it, select the first second or so before the music starts and then choose Effect -> Noise Removal. Click the Get Noise Profile button and Audacity will sample the selected noise. Click OK and the noise will be filtered from the recording. To complete the process, choose File -> Export and save the audio file in the format of your choosing.